Much of the greatest popular music exists due to the question “what if?” What if we used this pedal instead of that; what if we sung this line over and over and then layered our voices; what if, what if. But what if someone with the command and image of Lana del Rey or Marina Diamandis fronted a rock band heavily influenced by shoegaze and retro sound? 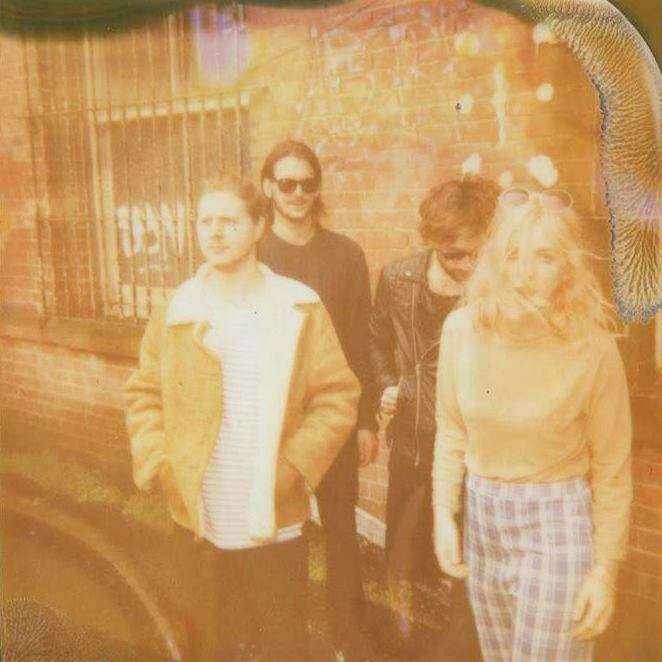 The answer to that particular what if would be Black Honey — Izzy Phillips (vocals; guitar), Chris Ostler (guitar), Tommy Taylor (bass), and Tom Dewhurst (drums). Since their formation, they’ve garnered a large fan base in both their native United Kingdom and abroad, and supported such acts as The Cribs, YAK, Twin Peaks, and most recently Catfish & the Bottlemen. Their penchant for creating a retro, mystique-ridden image is well-known amongst their fans and anyone who cares to follow them on social media — the Brighton group plays with a plastic pink flamingo onstage and does not have one specific website. Black Honey really do fit into their own category. Best described as a fusion of the vocals and image of a Lana del Rey (or — if you stretched and squinted — maybe even Nico) figure and the best of dreamy shoegaze, frontwoman Izzy Phillips chameleons between Debbie Harry-esque rocker and retro chanteuse — complete with guitar and full command. Headspin, the group’s second EP, gives us the woman whom listeners have come to love in songs like “Madonna” and “Corrine” — a woman who (perhaps alluding to the “we live in a movie” lyric of the latter) is starring in her own unique soundscape. 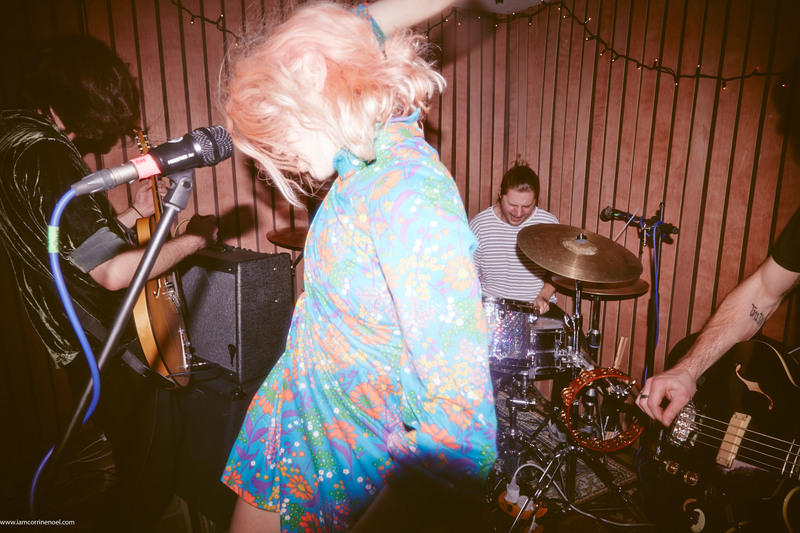 From spitting choruses to cinematic whorls of sound, the four-song EP showcases Black Honey’s ability to transcend the typical constraints of “indie rock.” Headspin dips between shoegaze, dream pop, and unadulterated rock to create a fluent collage of songs. Headspin kicks off with the punchy, energetic “All My Pride,” in which Phillips blasts a significant other. Originally released as a single last month, the rock-heavy anthem boasts that Phillips “hasn’t got a thing to prove” to either her lover or anyone who tells her what to do. Between several Pulp Fiction-reminiscent guitar riffs, Phillips claims her independence. Her significant other might be gone with all her pride, but he hasn’t taken everything. The measure between Phillips’ vocals — drawn-out to the slightly-spit “prove to you”s — give the song its balance, ensuring it doesn’t stray far into either desperation or anger. Though the song’s token “he” may draw Phillips in enough to want him despite the “demons” she knows to surround the entire situation, what she’s really sick of is being told of how to feel. Yes, he has drawn her in, but she shouldn’t have to feel bad for playing with fire. It may burn (he ends up leaving with “all [her] pride”), but as the chorus so simply states, Phillips has no need to prove anything to anyone—be it her lover or those who tell her what to do. As the sounds slowly build, Phillips touches on the link between music and love (or restrained lust). Phillips describes an elusive “he” as swaying his body to and fro as she joins in. The guitar slowly builds as she traces them floating “away to the other world,” simultaneously transporting the listener so that by the time she reaches the high note on “spiraling into the dark,” the listener is swaying along with the two in the song. By the time the chorus hits, the fazed out, cough-syrup-dream-trance vocals coupled with feedback-heavy shoegazey backing have fully created another world of sound, a dream-world only accessible by music. Touching on a love that seems fated (“you only love me when I’m cursed”), the coupling of the otherworldly ambient sounds gives “Headspin” a strangely epic and near-cinematic feel. One could easily imagine swaying along with the song’s protagonists in a Lynchian room with checkered floors and big red curtains (if Angelo Badalamenti is reading this, I’d like to take the time to plug some sort of collaboration with Black Honey for the Twin Peaks reboot). But despite the huge soundscape created, the focus is on music, physicality, and their twin effects. Both the record machine and Phillips’ counterpart are responsible for her physical reactions. Though the song takes place in what sounds like another world–a TV world or an alien world–it’s music that allows us to join Phillips there. 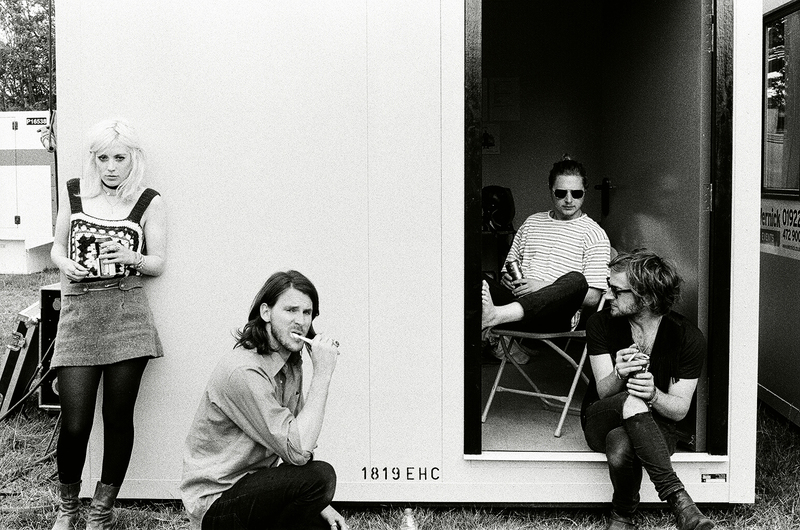 “Mocking Swing,” the final track, finds Black Honey transitioning back into dreamlike sound. With one guitar playing the melody for most of the song, it’s almost a lullaby. As Phillips begins to sing of “white noise on TV screens” and “wandering into the dark,” her trance-y vocals beckon to follow. However, there’s that bite in her vocals coupled with a bite in lyrics that betrays the breathiness — it’s not a mocking bird of lullabies, but a mocking swing that Phillips describes. The disjunct between lyrics and melody is slight, but just enough to jar listeners. The melody builds slowly as Phillips goes on to state that the person she’s addressing “only wants what’s wrong” for them, as well as “chose to self-destruct.” The last line of the song remains open — ”it’s nobody else’s fault” could apply to whomever the listener chooses. And as the soft melody fades, there’s a brief bird chirping and muted guitar slide before the track cuts off, keeping listeners waiting for more. Headspin’s eclectic use of sounds gives it a completely unique feel. 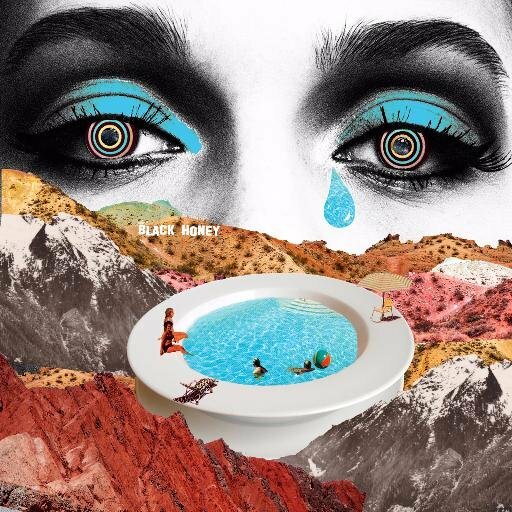 Maybe it’s the charmingly vintage feel of the EP cover (or of anything Black Honey posts on Instagram), but Black Honey’s latest EP creates a soundscape so effectively that it’s not impossible to imagine a film to follow. For now, though, the EP itself is more than enough to take listeners on a sonic choose-your-own-adventure.